Why is it Important to have a good Alexa Rank? Alexa ranking and visitor estimates are constantly updated by Alexa and according to their marketing and public perception the ranking reflects the popularity of a website. In a fast growing market like the Internet with hardly any reliable indicators available, business partners pay a lot of special attention to the Alexa Rank. Alexa traffic estimates are perceived as highly significant in judging the visitor numbers and country popularity of a website. Therefore, every webmaster who wants to increase advertising revenue has little choice but to work on improving his site’s Alexa rank as the foundation stone for negotiations. Another not insignificant benefit of a good Alexa rank is the fact that you see your own site better listed in search engines. Since Soccerwidow/ Fussballwitwe dropped below the 150,000 Alexa rank mark, we have begun to receive advertising enquiries from ad agencies, now that the site is considered as being “popular”. Despite the fact that Alexa information is tremendously inaccurate, this seems to be totally irrelevant in the minds of dealers. Indeed, a whole website industry seems to be built on a huge set of false beliefs about site demographics, visitor engagement, geographical popularity, etc. What does Soccerwidow / Fussballwitwe’s Alexa Ranking Mean? The Alexa Traffic Rank tool scores sites relative to all other sites in the world. For Soccerwidow.com it means that on 25 October, 2013, from Alexa’s 30 million rated websites, we were ranked 124,074th. By the way, it is said in many places on the Net that every position under 1,000,000 is a real achievement, something a website owner should be proud of. However, for estimating real visitor numbers or assessing which countries visitors come from, the information provided by Alexa is utterly pointless. The screenshot on the right shows that in the last three months, 39.47% of all Soccerwidow.com visitors came from the USA. 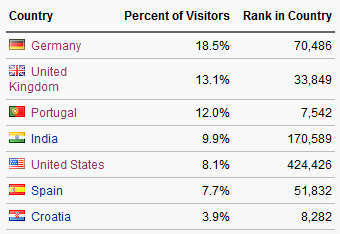 16.08% of all visitors came from the United Kingdom, and only 1.21% from Germany. It is common knowledge that advertisers prefer to market their online wares to USA, UK, Australia, and Canada, and our traffic from these four countries totalled 61.88% of all visits. As Soccerwidow is currently receiving around 130,000 page views per month, this means that there were approximately 80,000 page views (per month) from countries which are sought after and targeted by English language firms and their ad partners. However, Alexa shows a completely FALSE picture! 18.5% from Germany, 12% from Portugal, 9.9% from India, and 7.7% from Spain. 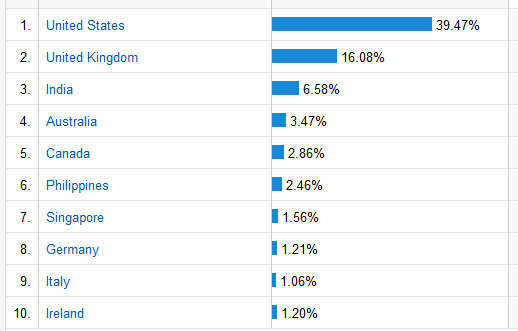 The U.S., which actually accounts for 39.47% of all visits to Soccerwidow.com (the Google Analytics screenshot above) is indicated by Alexa with only an 8.1% share. We receive very few visitors from Spain, Portugal, Croatia, and India but these countries continue to be displayed as claiming high portions of our entire visitor percentages, according to Alexa. In Croatia we have even reached a country rank of 8,282. Incredible! But totally misleading. Unfortunately, many agencies look up Alexa data and decide that Soccerwidow does not have enough visitors from advertisers’ preferred regions. This could also be the end of their enquiry as no further thinking is apparently necessary, and what is the point of chasing the webmaster for clarification, if the ‘oracle’ which is Alexa, says otherwise. This leads to hardly any advertising revenue despite the excellent visitor numbers from countries which advertisers wish to specifically geo-target. To date, of all the enquiries we have received from ad agencies, only one has asked us for our own, more reliable, self-generated visitors stats.